Remerciement à Wineterroirs.com qui à relayé l'événement du vendredi 14 décembre 2012.
impromptu before or after their shows during the 1980s'. Somehow you get the message from these unpolished photos, whether from the 80s' particular mood or from a particular musician you're not used to see away from the pressure of the public. The other hero of the day was Fabien Bergeron, he is the man who tends Pierre's vineyard and who does the winemaking too. I arrived early at this free-tasting event and that was a good thing because the place filled up quickly after some time, and an hour later it would have been pretty tough to make a relaxed portrait like this one. At first, as his family wasn't into the wine trade, Fabien worked for wineries to make a living, places like Chapoutier and Jaboulet and other top wineries of the region, he'd do the pruning and other outdoor work in their steep vineyards and he gradually purchased a few parcels when the opportunity showed up. Little by little, he could thus begin to make wine himself from his own plots but he kept until now this service business for other growers to secure his position as he only owns about 3 hectares of vineyards. See a couple of pictures of Fabien Bergeron in his vineyards. Fabien Bergeron has now a surface of his own making about 3 hectares which he finds time to tend in spite of the time he spends working for others through his vineyard-management service company La Tâche. He tends also Pierre Terrasson's one-hectare vineyard, Pierre living most of the time in Paris and his mother still living in the family house near Tournon.. All these vineyards including most of the ones Fabien Bergeron services for others are on steep slopes and difficult terrain, and his vineyard-management company has a good expertise for the work on this kind of relief. He doesn't spray weedkillers but uses cable plows, which are walk plows powered by a machine pulling the plow from the other end of the vineyard. I saw such cable plows while visiting Thierry Allemand but it's a common tool for growers who want to keep working on steep slopes without destroying their terroir with weedkillers. The difficulty he faces in some steep parcels comes from the fact that they were planted at a time (in the 70s’ and 80s’) when growers already planned to use weedkillers, and they didn't care to plant the rows in alignment with the slope. Because of this, he sometimes has to permanently counter the tilting of the slope while holding the walk plow, which is pretty hard to do. Of course when Fabien plants a new vineyard on a parcel he purchased, he plants the rows in a way that is compatible with cable-plow, that is, with the right orientation as regards to the slope. Fabien Bergeron began to farm Pierre Terrasson's parcel in 2003, there was then the equivalent of 25 ares planted surface remaining on Pierre's family property, with which they used to make their own wine with the help of another vigneron. Fabien rented from them some additional slopes on which he planted more Syrah in order to grow Pierre's whole planted surface to 1 hectare. Pierre and his mother for example wouldn't have been allowed anyway to plant new parcels themselves, you got to be a vigneron and either rent or own the surface to have the right to do that in France. Fabien Bergeron also began to vinify Pierre's grapes in 2003, starting with the harvest because Pierre needs to be in Paris usually around september. The slopes of the vineyards including the other ones owned by Fabien are on a 50 % range, this is indeed very steep. In the mid 60s’ at the age of 13, Pierre used to foot crush the grapes at home with his parents under the supervision of a local farmer. He remembers he was a bit drunk just by breathing the vapors. The wine then was not very well worked, it was a simple wine they would drink along the year, it wasn’t even labeled as Saint-Joseph but with the former name of Saint-Joseph, the vin de Mauves like it’s referred to in Les Misérables of Emile Zola (Mauvesis a village of the area). Plus, in the family cellar, the casks were not in good conditions, some were too old, possibly tainted and the wine didn’t age well back then in the 60s' and 70s'. __ La Tache, Saint Joseph 2007 Guillamy. From 30-40-year-old vines. 13,5 ° in alcohol. It’s syrah, mostly, with a little bit of Marssanne for which there is an 5% blend authorization. His Marssanne is complanted in the Syrah, like it used to be in the past. The elders did that also because they liked to eat grapes while working in the vineyard as this variety ripes earlier, and Marssanne also brings a feminine side to the wine, plus a bit more alcohol. But Fabien says that the main reason is that the vignerons liked to eat grapes, that’s why it was often Chasselas which was chosen. Farmers could this way walk down to the valley after working on their parcels and sell these white table grapes as accessory revenue. Cherry trees were common in the vineyard long time ago, and they were useful beginning with the welcome shade. Now it’s mostly single-crop country but Fabien says that there’s nothing forbidding to plant fruit trees in the vineyard, at least in this part of the Rhone. He says that people used to say that wherever there were peach-vine trees, there was less oïdium in the vineyard, which would prove the usefulness of complanting trees in the vineyard. Very fresh wine, goes down very easily, with refined tannins. I’ll almost help myself but resisted and asked politely for another pour from Fabien. The freshness is always there on these wines, Fabien says, the vines are not enhanced by fertilizers and don’t make too much sugar, plus the fact that there’s no destemming plays also a role although it’s supposed to result in less acidity. The tax-incuded price in Paris is 23 € and in the winery it’s more like 16. 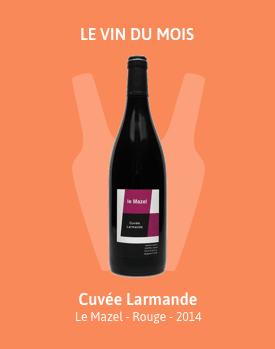 He made 4000 bottles of this cuvee, about the same volume as Badel, which is the cuvee made on Pierre’s family property. 2007 is a more classical vintage in the Rhone, there was neither too much rain or too much sun, contrary to 2009 when the vines were stressed by temperature at more than 40°C and even more on the slopes The wine had an élevage in casks of 16 months plus a couple of months in a vat, and was bottled in 2009. The vinification began with a whole-clustered grapes in open tronconic vats with foot stomping just enough to let the fermentation starts, followed by a carbonic maceration for about a month, covered with a plastic sheet. At the end of this maceration he foot crushed the grapes in the tronconic vat twice a day, in the morning and in the evening. Then the wine goes into casks where it stays for a year without racking, after which he decides how long the élevage will last. He may then rack the wine into other casks for another few months or even another year, it depends of the vintage. __ La Tache Saint Joseph 2009 Badel. From Pierre’s family vineyard. Although supposedly from a more difficult vintage, the wine also an easy-swallow wine with good freshness. The tannins are more forward because the wine is younger but they’re not harsh. Fermented more than one month in open wooded vat. In spite of this hot year (2009) the alcohol is not very high, it’s 12,3 proof. Fabien says that from what he witnessed the heat was so tough that the vines withdrew sap from certain grapes, as if it had had to choose between surviving or cutting supplies to certain clusters. He noticed many grapes remained very small, and after tasting they seemed to have no sugar either. The vine has found its balance in spite of the difficult season in 2009 and Fabien never needs to correct the wine in the cellar. He says that the balance is often missed when the vineyard receives too much boost, like with foliage fertilizers (engrais foliaire) for example : in that case the vine is not stressed enough and feeds its grapes too easily, yielding too much alcohol without the correlated acidity. That’s often what leads to 14 or 15 ° In alcohol and to corrections in the cellar, he says. He notices it on some of his clients’ vineyards where he works as a service company : there’s often one point more in alcohol in their vineyard at the harvest season while these vineyards are planted on virtually the same type of terrain and of a comparable age than his own. She got her copy signed ! Fabier Bergeron wines can be found at about 20 wine shops in Paris, among which La Cave des Papilles, Cave de L'Insolite, La Crêmerie, Cave de Reuilly. He exports to Japan (Vinscoeur), Norway (through Vinergie), the U.K., Holland, Germany. Don't think that the following lines were inspired by the wine shop or the result of some undisclosed reward from the owners. I was just amazed at the choice of magnums at la Cave des Papilles and thought it might interest readers looking for larger bottles. All the bottles standing or lying on the top of this table are magnums, from different cuvées and wineries, and they have more magnums in another spot in the shop, this makes a few dozens different labels altogether, and all from what I saw made by excellent vintners.